Many designers have released bags lately to raise funds for charities helping Japan rebuild following the devastating earthquakes and tsunami. These initiatives are certainly worth supporting, but I wonder why the accessories are all so cheap and cheerful. 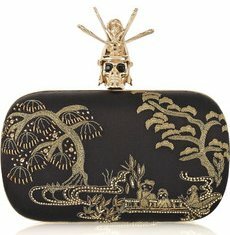 If you're looking for a more glamorous way to show your solidarity, this Alexander McQueen Samurai Skull clutch could be just the ticket. Now admittedly this purse doesn't raise those much-needed funds for relief efforts, but it does look the part. Alexander McQueen's classic skull box has been given an Asian makeover. The skull's wearing a samurai helmet, and the silk-satin body with its golden embroidery looks like it could have come from a kimono. It's dramatic but not as ostentatious as many of the clutches in this collection. It'd take a little black dress from ordinary to something special, or provide the piece de resistance for an Asian inspired evening look. As with all box clutches though, it comes with some real limitations. While the leather lining makes the interior feel luxurious, its small amount of space is anything but. There's also no shoulder strap, so we're left to clutch it the old fashioned way. That's a shame really because your hand will cover the embroidery, which should really be admired. And the final limitation is, of course, the price. Alexander McQueen's accessories never come cheaply and at $2195 this one's no exception. You'll need to have a very full social calendar to justify spending that sort of cash on this clutch. The Alexander McQueen Classic Skull Diamante bag, a fabulous alternative to this skull bag.